Most Spotlight events take place on the Duluth campus of St. Scholastica. For detailed driving directions, visit our main maps and directions page. The Mitchell Auditorium is connected to Tower Hall. Please see the map below for parking information.No permits are needed for Mitchell Auditorium events. Parking is available in all designated parking spots for Mitchell events. Please do not park on roadways as you may be ticketed by campus security. The CSS Theatre is located behind Tower Hall. From the main entrance on Kenwood Ave., turn right at the top of the hill, and continue around the buildings, past the Mitchell Auditorium and toward the football field. There is limited parking directly behind the theatre, and additional parking in the Mitchell Auditorium parking lot. Somers Lounge is located in Somers Hall. From the main Kenwood Ave. entrance, take a left at the top of the hill and then turn right. There are several parking lots in the area. Somers Lounge is to your right. Parking for the Reif Gymnasium is in the Mitchell Auditorium parking lot. 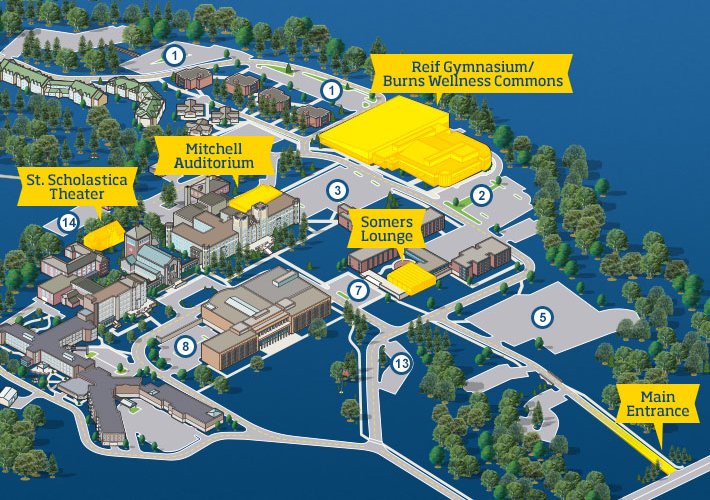 Enter the lower doors of the Burns Wellness Commons; the Reif Gymnasium is directly in front of you on the left-hand side.